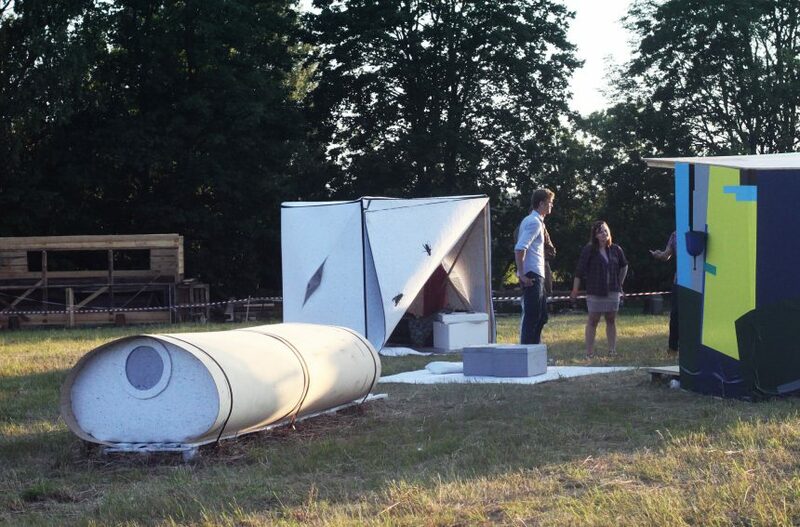 From the pop-up hotel project in the woods to the relaxing pod for a busy city life. 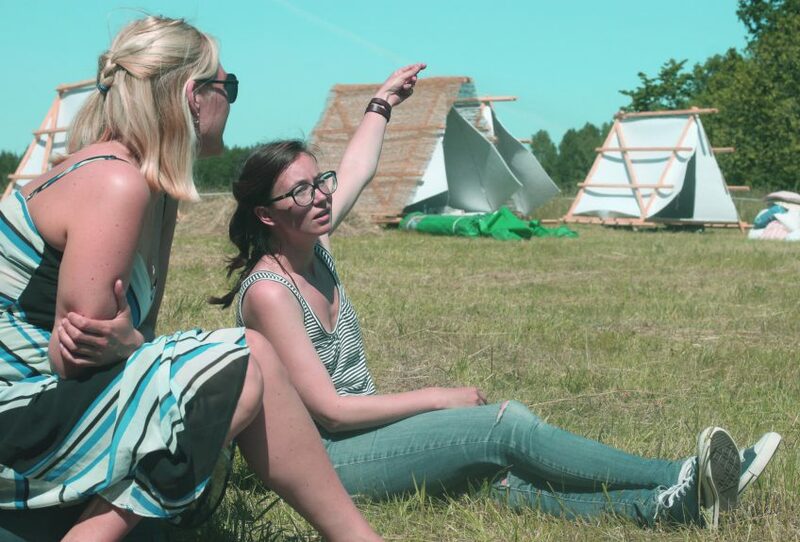 Muhu pop-up hotel concept was the first experimentation in the frames of Human Cities project in 2015. Instead of city the pilot focused in rural area. The experimentation took us to the Jazz Festival Juujääb, on a small Muhu island with low population density to solve the housing problem of a music festival. The initiative came from a famous jazz musician, organiser of the festival for more than 20 years, Villu Veski. 14 students and volunteering participants built 4 different models of temporary accommodation for festival guests out of industrial refuse. 14 students and several volunteers started to build the shelters 2 days before the well known jazz festival. The aim was to establish innovative ways of accommodating large number of people in an unintrusive and sustainable way. Kirke Tatar and Egle Lillemäe taking breath before the next construction task. All the shelters were made from leftovers of the industry. The international jury consisted of representatives of hotel industry, media, designers, musicians and festival guests who had slept in the shelters. They gave their comments as users and also stars to each hotel. The outcome had to be functional, aesthetically perfect and well branded. The winner with 5 stars was a shed called CUBE/KUUP, made from recycled felt by Egle Lillemäe, Kristiina Veinberg. 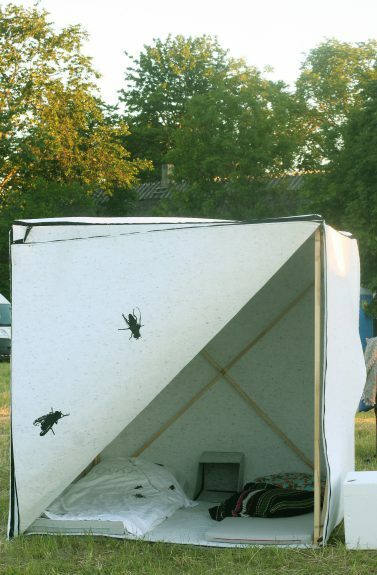 Cube was a small collapsible shelter from felt designed by Egle Lillemäe and Kristiina Veinberg. Cube got the highest number of stars from the jury. The project fulfilled the needs of the music festival. 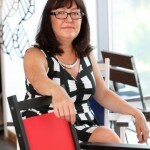 It showed how design thinking could create new value reusing leftovers of the industry, and how efficient design could be while creating a better physical and social environment by involving local players and users. 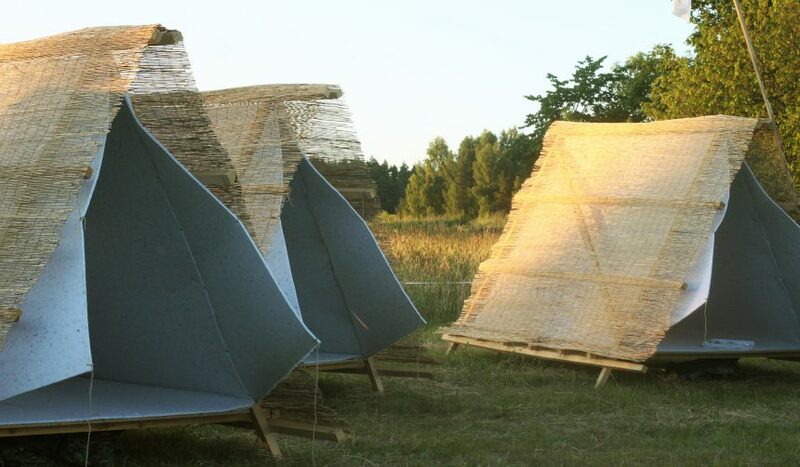 A comfortable shed from recycled felt and wooden construction where the jury members spent 3 nights during the festival. New models of service design and event management influence people’s thinking. Collaborative planning for homes, merging rural-urban divide, nomadic lifestyles, flexible living, sustainability, arts & entertainment, connection between breaks and <everyday life>, maker movement. The project results were shown also during Tallinn design festival 2015. Repetition with adaption took us to a new development of the concept. 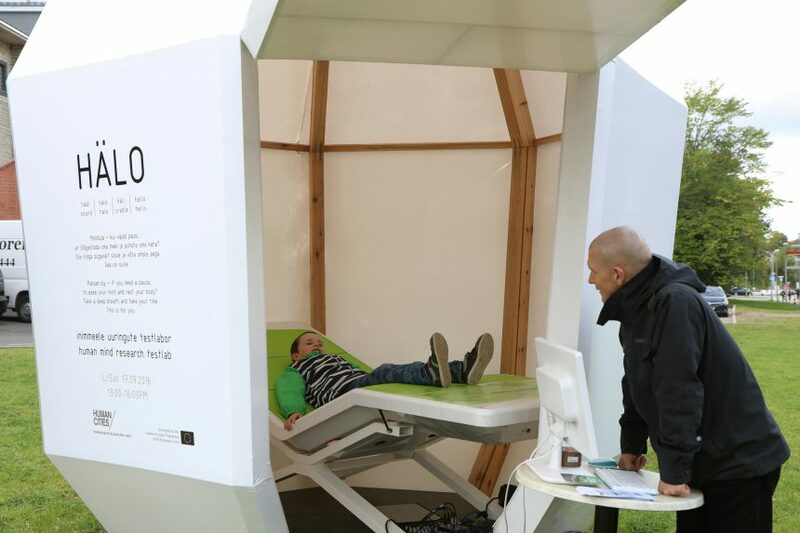 We moved with our project to the busy urban environment and called our Mind restoration pod concept – EX<IT. Because Brexit movement had an unpopular reputation we decided to rename the project – HÄLO. Hälo is a small asylum for 1 person for mind restauration; a small architectural masterpiece with ergonomic, eco friendly, aesthetic and high-tech solutions. It is meant for people in a busy world who want to find a peace and a moment with oneself; to diminish stress and recreate better spiritual and physical condition. Mindful pauses are great ‘spot treatments’ for times when you feel stressed but have lots to do. Relaxation or a nap 20-30 minutes of peace in a relaxing environment in the middle of a day could save the day and take you back on track. The pod will be combined from natural materials – it is meant to be built from plywood and felt will be used for soft surfaces. In the middle of the pod there is a comfortable half lying ergonomic seat. The pod is equipped with sound of nature and lighting technology which copies the sunrise. For a nap you need silence and darkness, for tonicizing you need a sun. 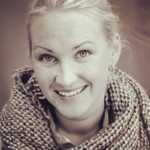 The potential venues for HÄLO could be big fairs, airports, big factories, schools etc. 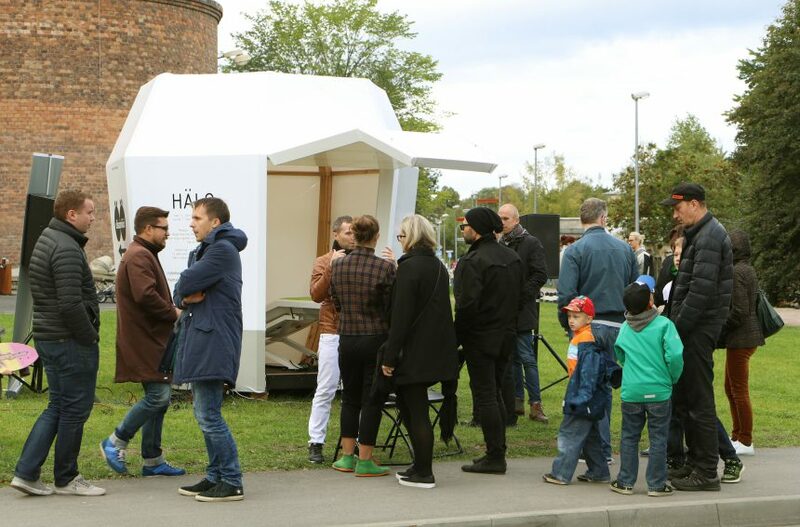 In 2016 the team built a shelter with the ergonomic couch for introducing HÄLO project and testing the prototype during Tallinn design festival DISAINIÖÖ. More than 80 people entered the shelter to get acquainted with the concept and share their opinion and vision. Nearly 40 people agreed to answer the questionnaires composed to test the idea of mind restoration pod. The HÄLO prototype will be presented at the final Human Cities partners’ exhibition during XIII Tallinn Design Week in 2018 September 10-16. An international conference will bring visionary urban life experts to Tallinn together with Human cities partners who will present their case studies.